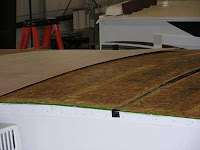 Why does a well-known RV manufacturing company insist on using dissimilar materials in the roof construction? They must be aware, like many others are, that steel staples (as well as stainless steel staples) will be subject to electrolysis when combined with aluminum sheeting. I ask this question because my RV is currently in for a roof repair and the root cause of the roof problem would appear to be caused by rotted staples that have been used to hold down the aluminum corner panels. Great question Barry. Technically what you are referring to is called “galvanic corrosion,” as opposed to electrolysis. Galvanic corrosion is basically a current flow that occurs between dissimilar metals causing primarily oxidation and rusting. There are a few things to bear in mind when thinking about galvanic corrosion. First, galvanic corrosion requires a corrosive medium in order to occur. And indeed water can act as this medium. However, if the materials are kept dry galvanic corrosion will not occur. Secondly, in terms of corrosion-resistance, metals are often classified as active (least resistant) and inactive (most resistant). Galvanic corrosion increases the resistance of active metals and decreases the resistance of inactive metals. What this means is when a small area of inactive metal (the staples) comes into contact with a larger area of active metal (aluminum roofing), the effect of the corrosion is greatly minimized. As a result, using stainless steel staples with aluminum sheeting is acceptable given the large differential in the surface area. Theoretically, the roof staples on an RV are not supposed to get wet and are therefore not susceptible to galvanic corrosion especially when coupled with the active/inactive properties. When galvanic corrosion does occur anywhere on an RV, the primary cause is water leaking into the affected area and it is the cause of both the galvanic corrosion and the wood damage. In your case the “rotted” staples indicates that they probably got wet before the corrosion actually started. For the most part, I’ve got to believe that RV manufacturers understand the principles behind galvanic corrosion and adhere to somewhat strict processes designed to minimize its potential by properly sealing the area. But water intrusion is indeed an RV fact of life. Proper maintenance to roof edges, seams and moldings must be performed regularly.